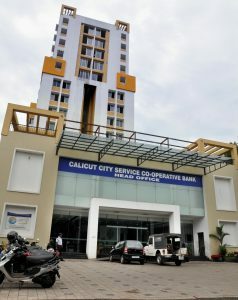 The Calicut City Service Co-operative Bank, one of Calicut’s most preferred banker commenced its operations in the 24th of July 2002. With a vision to serve the growing city’s rising financial needs, the Bank has been introducing innovative policies, schemes and loan plans, especially for common man, ever since. The Bank’s beginning was a humble one. But within a relatively short span of 12 years, the bank grew from strength to strength, and is today the number one bank in Kerala with 24 branches including a special mobile branch too, the Bank caters to the requirements of a wide spectrum of people; an achievement worth mentioning for a bank operating in the co-operative sector. No surprise that the Bank was awarded the ISO 9001-2000 certification for all-round excellence in the sector. What makes the Bank different from others is an obvious factor; it’s customer-friendly policies ,approaches and delivers. We believe that customer is the core of every business and enterprise. The complete fulfillment of their needs is our motto. That is why we draft all our deposit schemes and loan plans in a highly customer-oriented manner. The first co-operative bank to have 8-8 core banking. In it’s journey to a sought-after enterprise for top quality and client-satisfaction, the Bank has been promoted to a ‘Class 1 Special bank’ since September 1 2005. After the norms for Super Grade Banks were implemented, we have been functioning under the status of a Super Grade Bank and according to that norms since 01/4/2013. The success of every organization or enterprise largely depends on the quality and selfless service of its staff members. The Calicut City Service Co-operative Bank is fortunate to have committed and loyal work force who are our asset and backbone. Today, the Bank has 161 permanent staff members. Also in the list are 50 Nithya Nidhi collection agents who work on a commission basis. The Bank is highly committed to the personal and professional development and well-being of our staff. As a part of this, the bank has been conducting various initiatives such as training programs and workshops which would help them come out as better professionals who would be there for the customers, always. Bank has started a Dialysis Unit near Dr’s PolyClinic, Chalappuram. Dialysis Unit consists of 6 beds absolutely free for the right persons. We have started a City Charity Deposit Scheme to expand our charity work.